Your one stop engine rebuilding Lifeline! 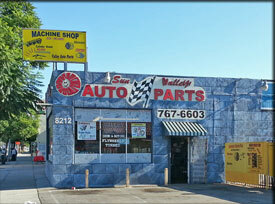 Since 1979 we have been rebuilding engines and selling quality replacement engine parts to mechanics, shops, and DIY's from the same location in Sun Valley, Los Angeles. We are passionate about cars, engines, and dogs. We build, we bruise, and curse along with you! We are a Los Angeles based company committed to quality workmanship, quality parts, team effort, and excellent customer service. We enjoy being part of the automotive community, so don't be shy, contact us if you need parts or service. We will answer your questions to the best of our ability. WHO ARE WE? WE'RE ENGINE BUILDERS, JUST LIKE YOU. Our mantra is Rebuild & Reuse. We do our part to save the environment by Recycling engines. Breath new life into your engine, and save money. It's a heck of a lot cheaper than buying a new car and may increase the value. Your car is an investment. You rebuild your engine or we can rebuild it, either way we have you covered. Save Time, Money, and Hassles, get the job done and back on the road. Cars, auto parts, and engines...it's what we do. We carry a full line of internal and external engine parts. Not all parts are listed on this site, but are available, and just a phone call away to add to your order. Online we have the most popular items for sale, so call if you do not see your item. We carry just about everything and can always create an invoice with all your items. We cater to DIY, mechanics, and commercial accounts. Auto Parts for import and Domestic cars, trucks, forklifts, marine, and commercial vehicles. Gas and diesel engines. We proudly carry DNJ Engine Components, they offer quality parts, we use them to rebuild engines every week. We carry many brands also: Felpro, Hastings, Melling, NGK, Fram, Moog, Monroe, Bosch, Airtex, Gates, etc. If you are not a backyard mechanic or a DIY-er, no worries. We have a Full service auto machine shop on the premises. Offering cylinder head repairs, valve jobs, engine rebuilding, block work, welding and more. Expert machinist on staff with 40+ years experience. 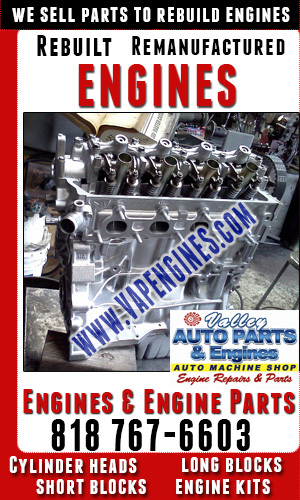 Check out photos of our engine rebuilds, using many of the engine rebuild kits we sell on this site. (Long block & Short block), valve jobs, and cylinder head repairs. for information, click Machine Shop. Visit our Blog to see photos of us rebuilding engines, boring, honing, valve jobs, welding, cylinder head repairs and more.